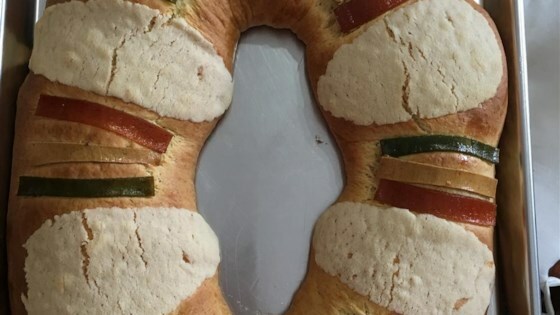 "This traditional holiday Mexican bread is a bit time-consuming, but absolutely worth the effort." Mix 4 cups flour, eggs, egg yolks, 2/3 cup white sugar, water, dry yeast, orange zest, lime zest, and salt in the bowl of an electric mixer fitted with a dough hook. Add 1/2 cup plus 1 tablespoon butter; mix until dough is elastic and shiny, about 5 minutes. Form dough into a ball. Cover and let rise in a warm place for 45 minutes. Punch down dough gently; roll into a long cylinder. Join the ends of the cylinder together in the shape of an oval ring. Place ring on a greased baking sheet; cover and let rise in a warm place for 45 minutes. Whisk eggs whites in a small bowl. Brush egg whites evenly over dough. Mix 1/2 cup white sugar and 1/4 cup butter in a small bowl with your fingers to form a paste. Add enough flour to give paste the consistency of Play-Doh(R); divide into 5 or 6 balls. Place each ball between two 3-inch squares of parchment paper. Press with the bottom of a 1-cup measuring cup to make a circle about 1/8 inch thick. Space circles evenly around the dough ring. Arrange candied citrus peels on top of the dough. Bake in the preheated oven until golden brown, about 20 minutes. Cool for 20 minutes before slicing. Don't worry too much if you do not see much change in the dough, especially in cold climates. You do not need to use all 3 egg whites to brush the dough. If your paste is too dry in step 6, you may add 1 teaspoon of egg white. Use candied citrus peels in 2 or 3 different colors if available.